Now that React 16 is finally released ? I thought it would be time for a nice article (or maybe a serie of articles ?) about React and its ecosystem! This article is meant as a nice introduction to React and the React ecosystem. In future publications I would like to go more in depth about performance improvements React 16 provides. The unit tests are finally successful! React 16 is released! ? When using React you split up your application in lots of smaller components. A component consists of event handling, styling and sometimes state. This makes a component an isolated and reusable piece. These components can be combined into larger components. As seen in the snippets al the JSX code is now transformed in React.createElement() calls. Every React component can contain state. In the most basic form state is just an object which lives inside a component. The idea is that every time the state within the component changes, the component will re-render using this new state. The diffing algorithm then decides which parts of the component needs updating. An example of state in a component can be a simple increment. Every time the setState is called the component will re-render. When your application grows larger and larger you might want to look into a more robust state management system such as Redux. A React Component can also contain styling. The most basic way of styling is filling the style property of a component. This property accepts an object of CSS rules in a key-value pair. You can also use a more classic way of styling by referring to style using the className property. The issue with this however is that you make it harder to reuse your components elsewhere. Using the style property of a component is a basic way of styling, there are tons of libraries which can make styling components easier. The React components are rendered in a thing called the Virtual DOM. The virtual DOM is a browser independent implementation of the DOM and does smart stuff like batching before applying changes to the real DOM. The virtual DOM can then be applied to the underlying platform using tools such as React DOM. This operation saves the developer a lot of work and increases the rendering performance (in most cases). Also the developer doesn’t have to think about how and where a node should be placed. Every component can represent a part of the view. These components together form a tree structure. 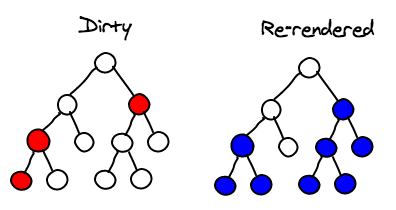 React then decides when a change occurs what part of the tree should be re-rendered. The algorithm to decide if a component should be updated or not is called ‘Reconciliation‘. React in itself cannot render into a browser or into any other type of application. To render a React application in the browser for example a tool is required called ‘React DOM’. The main responsibility of React DOM is that your React components will be rendered correctly into the browser dom. Other responsibilities of React DOM are basic event handling. React can be used in much more places than just in the browser. In the next few sections I listed some alternative platforms where React can be used. These are only a few of many implementations. Did you read this correctly?? Yes. React VR is React for Virtual Reality experiences. React VR uses WebVR but it makes it easier to write VR applications using the well known React structure. React blessed is a library to render react components in a terminal. React Native macOS is like React native but then for the macOS platform. With React hardware (Arduino on steroids ?) you can talk to real hardware. For example to turn a Led on and off. What problem doesn’t React solve? React solves the view rendering part. Most applications are way more complex than just plain template rendering. React doesn’t provide solutions for things like data fetching, state management, the way you style your application or your overall application structure. This is something you’ll have to implement yourself using libraries such as Redux or Mobx (for state management). You can also use a more framework like implementation of React such as Next.js. So in order to use React in larger projects you have quite some boxes to check ✅. What is Babel and how does it work?